Woman suffrage first appeared on the California ballot in 1896. Other territories and states in the west had already approved enfranchising women and advocates hoped California would become the “Fourth Star” after Wyoming, Utah and Colorado. On November 3, the issue appeared as Ballot No. 6, amending the California Constitution. In the first California constitution of 1849, women did win some property rights which reflected the state’s Spanish legal traditions. Many transplanted Easterners objected to such rights, feeling it threatened the superiority of husbands. Others thought such rights might bring women of property to the state. In 1874 the Women’s Christian Temperance Union (WCTU) was organized to combat liquor interests. Often women and children suffered from abuse by drunken husbands or fathers and had no recourse in law. 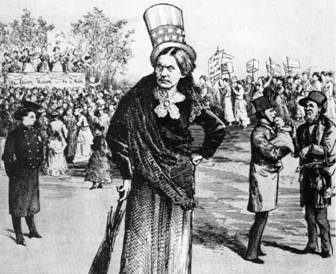 The organization grew rapidly and many of their numbers proudly supported woman suffrage. The Liquor Dealers League in San Francisco was alarmed about the connections between the WCTU and suffrage advocates. According to Mae Silver, the League included “the producers, proprietors and patrons of drink” and was especially powerful in San Francisco. In 1896 the City included 25% of the state’s voters. This cartoon showed Susan B. Anthony in 1873 after she had been arrested for voting in a New York election. A correspondent from Danville wrote this on October 10,1896: "Women suffragists seem to have met with rather a cold reception in this vicinity...which leads us to believe that our women are satisfied that their condition cannot be improved by a change, and they might not have so good a time as at present." Clearly California voters were not ready to take the step. The Contra Costa Gazette reported that women met almost immediately to analyze the vote. One article stated that the vote “showed that with a little more time and work we would have carried this county.” They rolled up their sleeves and began to plan for another effort.